After conducting research at a rigorous medical school, your students arrive for their first day of hospital duty only to be confronted with four sick patients, each with a different mystery ailment. How can your teams of student-physicians come up with the correct diagnoses? 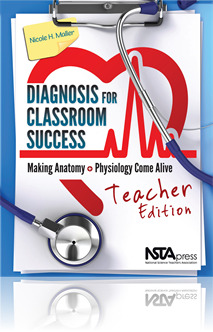 This attention-grabbing narrative and the corresponding role-plays are the basis of Diagnosis for Classroom Success: Making Anatomy and Physiology Come Alive. This high school curriculum gets your students deeply involved in inquiry-based science as it acquaints them with major body systems, sickle cell anemia, HIV, pregnancy, and diabetes. This Teacher Edition (which includes the Student Edition) spells out the book’s relevance to the Framework for K–12 Science Education and provides rubrics, answer keys, and prep tips to use before, during, and after the lessons. By blending the power of story with engaging investigations, Diagnosis for Classroom Success will cure what ails your lecture-weary biology classes. What is not to like about this volume and the curriculum? It provides students with real–life challenges about real–world problems. Students use high order thinking skills to solve a medical mystery of sorts. All the activities are student–centered and their success depends on their hard work and making connections. Topics within the curriculum are relevant to the students’ lives. The lessons, as the author states, fit into classes that are 45 minutes to 90 minutes. Preparation for this curriculum is designed to reduce the amount of work an educator has to do. A student workbook can be purchased so a teacher would not have to spend their life at a copier. I highly recommend this book with its original approach to having students understand the workings of the human body.